I am so excited to share my new book, I’d Rather Be Reading, with you. I will be traveling all over but of course not to nearly as many places as I’d like to. I truly hope you can come see me at one of the events listed below. These events and a few others are still coming together so please keep checking back here for more details and additional events. Details: This event is free and open to all. Parnassus asks that to get a book signed at this event, please purchase the book from Parnassus. Details: Anne will be joining Pantsuit Politics co-hosts Beth Silvers and Sarah Stewart Holland for a live, 60-minute podcast for the closing keynote of the podcast festival. You may attend the closing keynote only, or attend all events beginning at 4:00 pm. (The podcast festival begins November 1; tickets are available for both days.) Anne will sign books following the live podcast; books will also be available for purchase. Click here for more info and to buy tickets. 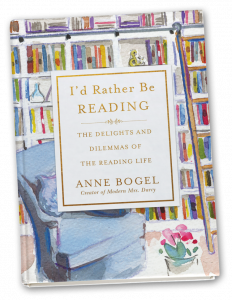 Details: Anne will discuss and sign I’d Rather Be Reading. This event is free and open to all.